Is Pope Francis Really That Different From his Predecessor? How Different Is This Pope? 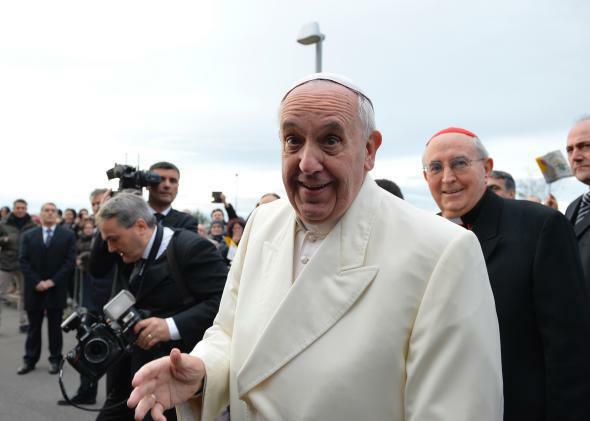 Pope Francis arrives for a visit at the parish of S.Cirillo Alessandrino on December 1st, 2013 in Rome. 1. [T]he conviction that the economy must be autonomous, that it must be shielded from “influences” of a moral character, has led man to abuse the economic process in a thoroughly destructive way. In the long term, these convictions have led to economic, social and political systems that trample upon personal and social freedom, and are therefore unable to deliver the justice that they promise. 2. Yet this defence of unborn life is closely linked to the defence of each and every other human right. It involves the conviction that a human being is always sacred and inviolable, in any situation and at every stage of development. Precisely because this involves the internal consistency of our message about the value of the human person, the Church cannot be expected to change her position on this question. 3. The world’s wealth is growing in absolute terms, but inequalities are on the increase. In rich countries, new sectors of society are succumbing to poverty and new forms of poverty are emerging. In poorer areas some groups enjoy a sort of “superdevelopment” of a wasteful and consumerist kind which forms an unacceptable contrast with the ongoing situations of dehumanizing deprivation. 4. The process of secularization tends to reduce the faith and the Church to the sphere of the private and personal. Furthermore, by completely rejecting the transcendent, it has produced a growing deterioration of ethics, a weakening of the sense of personal and collective sin, and a steady increase in relativism. 5. Corruption and illegality are unfortunately evident in the conduct of the economic and political class in rich countries, both old and new, as well as in poor ones. Among those who sometimes fail to respect the human rights of workers are large multinational companies as well as local producers. 6. The reservation of the priesthood to males, as a sign of Christ the Spouse who gives himself in the Eucharist, is not a question open to discussion. As you’ve probably guessed from my framing, 2, 4, and 6 are from Pope Francis’ latest apostolic exhortation. One and 3 and 5 are from Benedict XVI’s 2009 encyclical Caritas in Veritate. Yes, it’s a bit silly to complain that the difference between these popes is more messaging than substance. For religious leaders, the message largely is the substance. And it does matters which aspects of the church doctrine a pope chooses to emphasize. Francis is opposed to gay marriage, for instance, but from his few statements on the topic seems unlikely to launch the kind of full-bore assault on it that Benedict did. But I also wonder if both liberal Catholics and interested non-Catholics are themselves cherry-picking which aspects of his statements to focus on. From the beginning, neither group was really inclined to give Benedict the benefit of the doubt. At the height of the church’s child-abuse scandal, the Vatican chose as its leader a former member of the Hitler youth who had been on the conservative side of every internal debate on social policy, made dubious scientific claims, and seemed to take full advantage of the perks of the job. Francis, to say the least, has shown a defter touch. But a lot of the coverage of the new pope seems to be overlooking the fact that the critiques of unbridled capitalism were there under Benedict and even under Cold Warrior John Paul II, who said that it “agrees with Marxism, in the sense that it totally reduces man to the sphere of economics and the satisfaction of material needs.” At the same time, it seems to be glossing over the fact that he’s made clear that the church isn’t open to changing its position on controversial issues like abortion, gay marriage, or allowing women to be priests. Francis is, without a doubt, a far better global salesman for his cause. But it does seem like some of the pope’s new non-Catholic fans are both deluding themselves into thinking that the things they don’t like about Catholicism are going to go away, and ignoring the fact that the things they do like aren’t all that new.